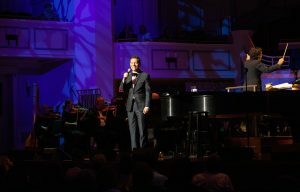 Michael Feinstein – Courtesy of Rob Slaven. Used with permission. 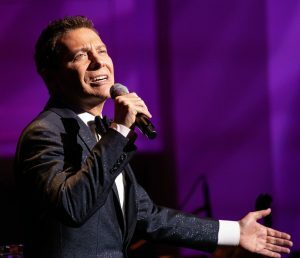 Over the years, I have had the great pleasure of seeing five-time Grammy nominee Michael Feinstein perform so many times, that I’ve lost track of the number, but when I do, I am never disappointed. Saturday was no exception. That’s when I saw Feinstein perform with the Carmel Symphony Orchestra in “That’s Entertainment” at The Palladium at the Center for The Performing Arts in Carmel. 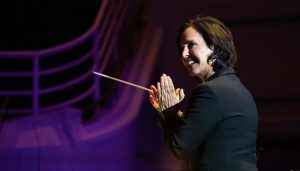 The concert was Feinstein’s first ever with the CSO, with music director Janna Hymes conducting. Having seen Feinstein perform numerous times before, I have also witnessed him perform solo, with piano accompaniment, trios, quartets, big bands and symphony orchestras, but it is the latter that really showcases his talent and the Great American Songbook songs and arrangements that are his specialty, if not his passion. And to their well-deserved credit, the CSO, under Hymes’s expressive baton, more than proved themselves with their lush, dynamic sound that complemented the artistry of world-class entertainer Feinstein. Choosing songs for his set list that neatly reflected the show’s title, “That’s Entertainment,” Feinstein, who could easily teach a college course in music history, introduced each tune with facts and anecdotes about its origination. Often delivered with dry humor, the background information he provided only added to the enjoyment of each selection. Janna Hymes – Courtesy of Rob Slaven. Used with permission. “Hooray for Hollywood,” from the 1937 film “Hollywood Hotel,” with lyrics by Johnny Mercer, was Feinstein’s opening selection for Act 2. Singing in his signature style featuring a delivery with a dreamy quality, he also sang Richard Rodgers “Isn’t It Romantic?” “The Way you Look Tonight” by Dorothy Fields and Jerome Kern, Jerry Herman’s “I Won’t Send Roses.” Radiating joy, Feinstein and the orchestra were potent together in “Alexander’s Ragtime Band,” another Irving Berlin classic. Concluding the concert on a poignant note, he sang “Somewhere” from “West Side Story” and appropriately, for an encore, he beautifully interpreted “Softly as I Leave You,” made famous by Frank Sinatra. Feinstein’s collaboration with the Carmel Symphony Orchestra and the appearance of the Songbook Academy All-Stars was a reminder of how very fortunate we are in Central Indiana to have in our midst, the renowned artistic director of the Center for the Performing Arts, the accomplished local orchestra, which is one of its resident companies, and the American Songbook Foundation headquarters. It’s a pretty heady set of circumstances and resources that should not be taken for granted. For tickets and information about the Carmel Symphony Orchestra visit carmelsymphony.org and for the Center for the Performing Arts, visit thecenterpresents.org.